First Republic Bank is a publicly traded company headquartered in San Francisco. The company has $67.9 billion in domestic assets, according to Federal Reserve statistics from September 2016. According to Consumer Finance Protection Bureau (CFPB) data, First Republic Bank had a total loan volume of $8.8 billion in 2015. The company is No. 27 in the U.S. for loan volume. Along with residential lending, First Republic offers other services such as private banking, private business banking and private wealth management. The majority of branches are in California. The company has branches in select cities outside of California, including: Portland, Oregon; Palm Beach, Florida; Wellesley, Massachusetts; Boston, Massachusetts; Greenwich, Connecticut and New York, New York. Almost 92% of its total loans outstanding originate from First Republic’s three primary markets: California, New York and Massachusetts. Does First Republic Operate in My Area? First Republic only offers mortgages in California, Massachusetts, Connecticut, New York and Oregon. Almost 90% of all real estate loans are within 20 miles of a First Republic branch. Most branches are located in California (over 50 in total). First Republic’s other branches are in Portland, Oregon; Palm Beach, Florida; Wellesley, Massachusetts; Boston, Massachusetts; Greenwich, Connecticut and New York, New York. What Kind of Mortgage Can I Get With First Republic Bank? The company recommends contacting one of its representatives, called “relationship managers” to discuss your loan options. The loans found on its site encompass a mortgage lender’s standard variety, minus government-backed loans such as VA, FHA or USDA. Fixed-rate mortgage: Considered a conventional loan, this type of mortgage has an interest rate that doesn’t change for the duration of the loan term. Most of the time, this type of mortgage is offered in 15-year or 30-year terms. Many borrowers like this type of loan because it’s easier to budget month-to-month as the payment won’t change. If you’re planning on staying in your house long term, it is a popular option. Adjustable-rate mortgage (ARM): Unlike fixed-rate loans, your monthly payments will change with an ARM. Why it’s appealing is because the introductory period (usually three, five, seven or 10 years) is offered at a lower interest rate than a fixed-rate loan. After that initial period expires, your interest rate changes every year, going up or down depending on the market. If your interest rate rises, you could pay more over the life of the loan than a fixed-rate mortgage. Interest-only: With this type of mortgage, you pay only the interest that accumulates on your loan balance for a limited period. After that, you begin to pay the principal as well as interest. All-in-one acquisition to construction to permanent loans: First Republic offers this loan to help make building a home — from start to finish — as easy as possible. One loan closing will save time and money and cover you starting from the land purchase all the way through completion of the home. Variable and fixed-rate loan options are available for this option. Vacation and second home loans: If you’re trying to refinance your vacation home or buy a new one, First Republic offers a number of options. You can choose between fixed-rate, adjustable-rate and hybrid adjustable-rate loans. Eagle Community Loan Program: This option is for properties in approved First Republic Bank census tracts and must be applied for in person. The program offers attractive terms like special fixed-rates and no prepayment penalties. Single-family co-op and condo loans: For folks looking at city properties such as condos, you can choose from fixed or ARM loans with flexible repayment terms. What Can You Do Online With First Republic Mortgage? 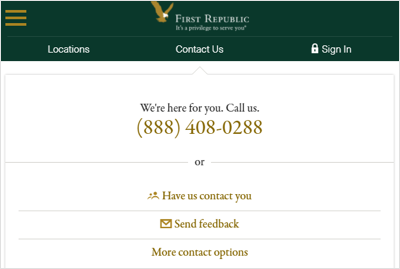 First Republic doesn’t offer the most robust online experience for hopeful borrowers. As far as lenders go, it falls short in a number of areas. For starters, you can’t prequalify online. You also can’t start your application through the site. Every mortgage page leads you to a contact number or form, or the office locator so that you can speak with a relationship manager. If you’d enjoy personal attention from a dedicated relationship manager, First Republic could be a good fit for you. However, if you’d rather start things off digitally, you’re out of luck with this company. It’s also hard to find concrete mortgage information on the site. Now, this may be for a number of reasons such as changing products and services, but you’re hard-pressed to find much information. Beyond the basic explanations such as what a fixed-rate mortgage entails, there’s nothing specific to First Republic. For the products that are explained, such as its Eagle Community Loan Program, no details such as required credit score or down payment are mentioned. 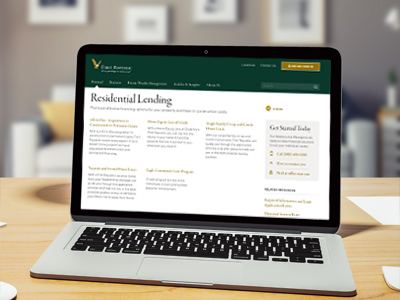 If you’re trying to educate yourself on the mortgage loan process, you can find educational resources on the site such as a “quick and easy guide to home mortgages.” Guides like these come in the blog post variety, so click around for a bit to find what you’re looking for. First Republic also has information on which documents you’re required to have for the application process. Would You Qualify for a First Republic Mortgage? Remember, before you seek mortgage qualification, make sure the home you’re trying to buy is in one of the five states in which First Republic originates loans. If the home you’re trying to buy isn’t in one of those states, you’re out of luck. As for First Republic mortgage qualification, the company doesn’t disclose much information to the public. Assuming it’s similar to most lenders, you can expect that your credit score, debt-to-income ratio and savings will play a role in your consideration. Good credit, such as a FICO score near 700, helps you qualify for a conventional loan. If your credit isn’t quite so high, you generally will have a harder time qualifying. While most lenders offer government-backed loans for less creditworthy borrowers, First Republic does not list any such loans as an option. You’ll have to initiate a pre-qualification, loan application or speak to a representative to find out what First Republic can do for you. Your down payment savings count toward your qualification as well. Most lenders need 20% down for a conventional loan. If you don’t quite meet that threshold, you may have to insure the mortgage with private mortgage insurance. This will be another charge to pay each month on top of your mortgage and home insurance. Lastly, your income and debt are analyzed in order to see if you can afford a monthly mortgage payment. The higher your monthly liabilities, the higher your income needs to be in order to keep your debt-to-income ratio low. What’s the Process for Getting a Mortgage With First Republic Mortgage? To start the mortgage process with First Republic you have to call the bank, visit a branch or fill out a contact form so a representative can call you. You can’t start an application online nor can you apply for prequalification or approval. 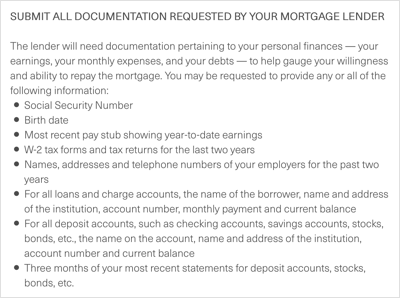 First Republic lists the personal information and documents required for the mortgage process on its site so that you know what you’re required to provide. Most of the documents will go toward proving your financial history, such as pay stubs, tax returns and employer information. First Republic relies heavily on its customer service, so you’ll be walked through the process with a relationship manager who acts as your personal advisor. This advisor will be with you every step of the way and can answer any questions you have about the process. In some areas First Republic comes up a bit short when ranked with its competitors. For one, the branch locations are far and few between, with 53 out of 68 located in California. If you are one of the lucky few who are located in a serviced area and have good enough credit to qualify, you can’t initiate anything online with First Republic. Some lenders such as Rocket Mortgage allow you to go through the entire mortgage application process online. Other lenders such as Wells Fargo and SunTrust allow you to prequalify from the comfort of your computer. Not so with First Republic. The company refers everything to its relationship managers, who you must call or meet in person to get the process going. The bank lacks some of the basic features and information found on other lender sites, as well. Its site is not for the savvy online consumer, you’re better off visiting a branch in person to get the information you need. First Republic Bank could be a good option for homebuyers who appreciate the individual, in-person attention you’d get from one of the relationship managers. Although you're hopefully getting your dream home, a mortgage can create many financial hardships for a family. Financial advisors are trained to help find ways to successfully include your monthly mortgage payments into your already demanding financial life. The SmartAsset financial advisor matching tool provides an easy way to get paired with one of these experienced professionals, and can be done by answering a few questions about your personal finances. There are many extraneous costs that accompany a mortgage aside from just your interest rate. Possibly the largest of these are closing costs, which can definitely take you by surprise after you feel like you've already committed so much money to a loan. In other words, make sure you take all fees and taxes into account before you resume your typical financial habits.